This season, we are hoping that black plastic mulch will be a better way for us to control weeds. 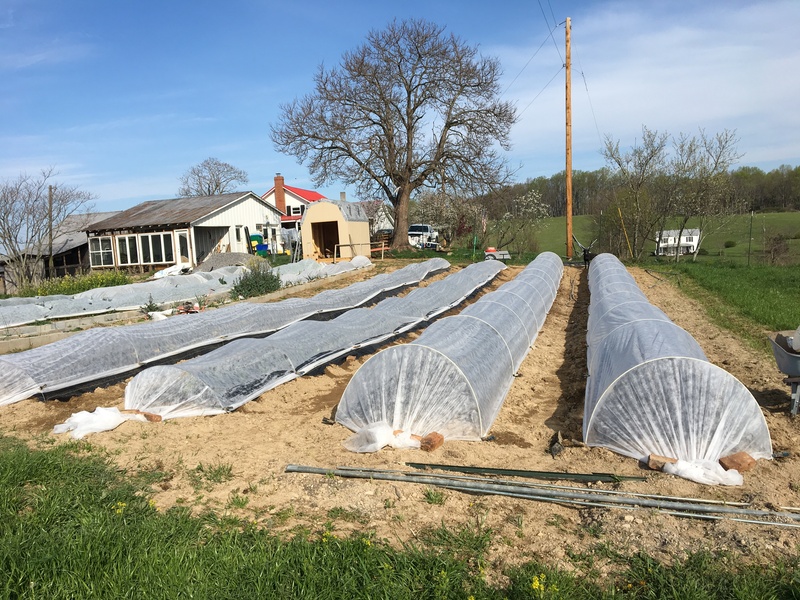 Although it is a bit of labor at the start, once in place the fabric should suppress weeds and decrease our labor during the season (so we can focus on our plants, harvest and markets). First, we reshaped the planting beds (goal was 36″ beds and approximately 30″ pathways). Compost and minerals were raked into the beds, and the bed surfaces were evened out nice and smooth. Next, we laid down the fabric by hand and used soil to keep in place. We will be getting more fabric to cover the pathways and staples to hold everything in place. Jordan made a nice template. The spacing works out to be 12″ between holes. This spacing will be used for our market cabbages, kales and greens. Jordan used a hand torch to burn the holes. Finally, the plants were transplanted into their beds. On the right is the red cabbage bed all tucked in. 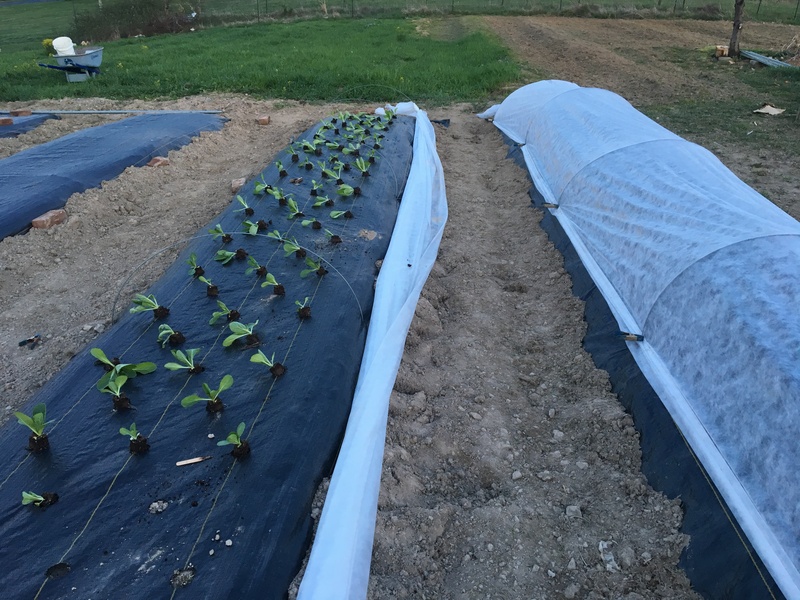 On the left is the green cabbage bed being planted. 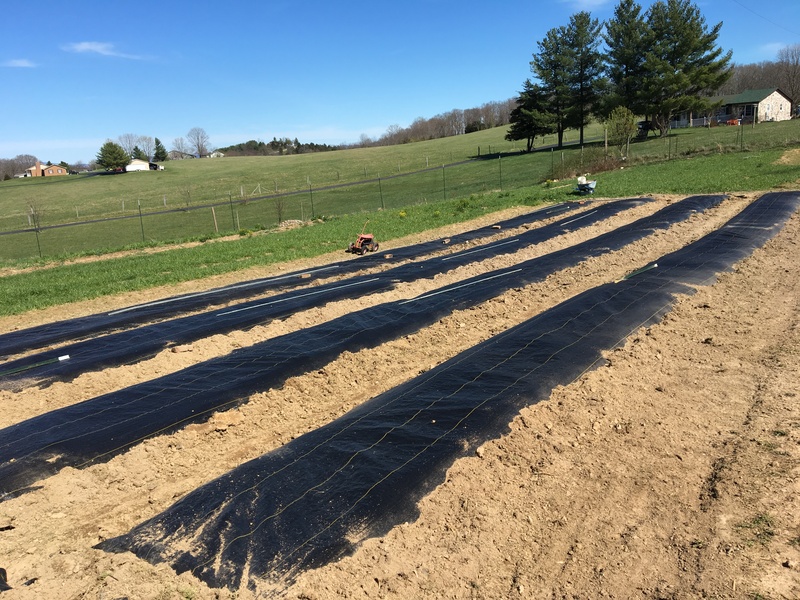 Row covers are used to protect seedlings from bugs, strong winds and heavy rains while allowing air and moisture to get through. Why are we going with fabric? 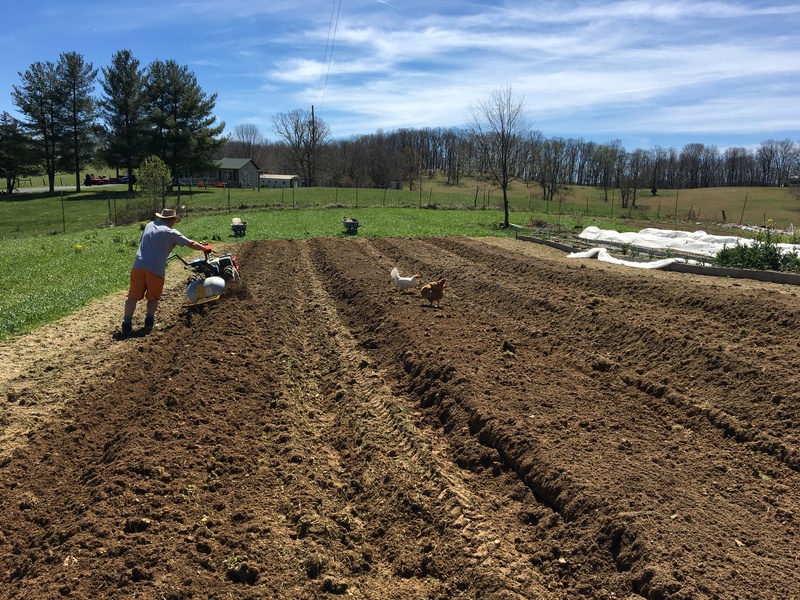 We are the only “employees” at the farm, and it is very challenging for us to maintain the garden and work full-time on the side. The fabric mulch should keep weeds at bay while still allowing water and nutrients to pass through to the soil. It will keep our beds more intact by protecting them from wind and water erosion, and the mulch should help retain moisture. Plus – the fabric should last us up to 10 or more years. The ability to reuse was important to us. It may be labor to remove and lay the mulch elsewhere depending on crop rotations and spacing needs, but it will be worth it in the long run. Challenges so far – I am not a good hole burner. Mine are far from perfect. Jordan is spot on with the template and torch. I am still learning about the temperature regulation. 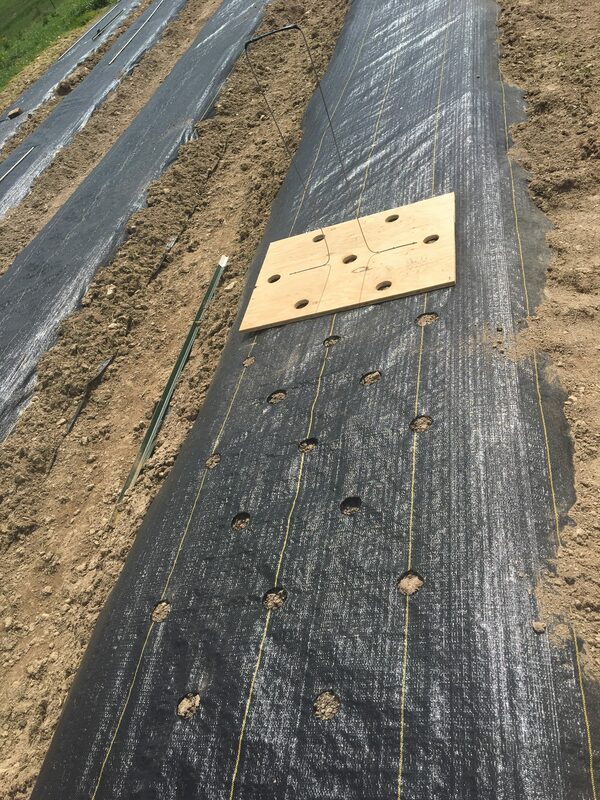 The black mulch heats up the soil and the row covers bump up the inner temperature. Although the fabric should help retain moisture, the inner temperature of the tunnels have stressed the new transplants a little. Frequent watering has been necessary to prevent drying of the soil and to cool the inner temperature of the mini-tunnels. I now open the row covers just enough for air exchange but not enough for chicken invasion. Is it really supposed to be 80degF in April???? The other challenge…chickens. They have been free range and can get in and out of the garden easily through little holes in the deer fencing. In the near future, some electric perimeter fencing will be installed to keep deer, dogs and chickens out.